This article is about the locality and Ebola treatment centre in Sierra Leone. For other uses, see Kerrytown. 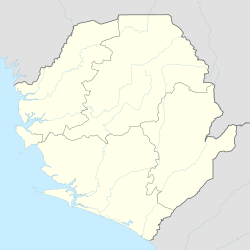 Kerry Town is a village in the Rural District in the Western Area of Sierra Leone. the town is located about 31 kilometres (19 mi) from the national capital, Freetown, which lies to the west-north-west. The population of Kerry Town is largely from the Krio ethnic group. The Treatment of the Ebola Virus clinic is located in Kerry Town. Kerry Town is home to a centre for the treatment of Ebola virus disease. The facility was opened in November 2014 during the Ebola virus epidemic in Sierra Leone. In early November 2014 the Ebola clinic in Kerry Town was completed after eight weeks of construction by the Ministry of Defence and handed over to the charity Save the Children. The clinic was the first of six planned clinics in the West Africa region. The clinic consisted of an 80-bed treatment centre with a 12-bed treatment centre for healthcare workers. The centre is staffed by Cuban and Sierra Leonean medics and international aid workers from Save the Children while the healthcare section are manned by British Army medics. On 29 December 2014, Pauline Cafferkey, a British aid worker who had just returned to Glasgow from working at the treatment centre in Kerry Town, was diagnosed with Ebola at Glasgow's Gartnavel General Hospital. ^ "Kerry Town, Sierra Leone Weather Forecast". Retrieved 30 December 2014. ^ Sarah Boseley (30 December 2014). "UK Ebola patient's infection a fresh setback for Sierra Leone clinic". The Guardian. ^ "Press release: First British Ebola treatment facility opens in Sierra Leone". GOV.UK. 5 November 2014. ^ Colin Freeman (5 November 2014). "British Ebola clinic opens for patients in Sierra Leone". The Telegraph. ^ Severin Carrell, Libby Brooks and Lisa O'Carroll (29 December 2014). "Ebola case confirmed in Glasgow". The Guardian. ^ "Hero nurse Pauline Cafferkey could have contracted deadly Ebola at Christmas Day service". The Telegraph. 30 December 2014. This hospital-related article is a stub. You can help Wikipedia by expanding it. ^ "Kerry Town Map — Satellite Images of Kerry Town". Retrieved 30 December 2014.